Balaia Golf Village near Albufeira, is in the centre of the Algarve on the coast between the quiet seaside fishing village of Olhos d'Agua and Paria d'Oura. This two bedroom apartment has a large living/dining room, kitchen and bathroom. The main bedroom has an ensuite bathroom. The resort boasts several spectacular swimming pools, tennis courts, table tennis, Gym (including steam room, Jacuzzi and indoor pool), 9 hole, par three golf course with Club House and driving range. Restaurant and bars also serve pool side snacks and refreshments. Two beautiful sandy beaches are within walking distance. Balaia is within easy reach of the main golf courses on the Algarve and of Vilamoura, Oura and Albufeira. Balaia Golf Village is the ideal location for a family and/or golfing holiday or indeed a romantic break. It is quiet and peaceful with outstanding facilities on site and with attractive beaches and night life nearby. Other Facilities: Car parking is available in front of the apartment. The apartment has two south facing balconies which receive the sun all day up to 5 p.m. These look out over the Moorish style apartments of Balaia Village. The front of the apartment overlooks the golf course. In the summer months there is a fully supervised toddlers/kiddies activities club. Reception: The reception is open 24 hours a day. Discounted tickets for golf courses, water parks and other facilities on the Algarve are available at the reception. Pick up from and drop off to the airport can be arranged at the reception. Winter: In the winter months the apartment is ideal for longer stay visitors seeking to escape the cold weather of northern Europe. If you do decide to stay with us please get in touch and we will arrange payment through a bank transfer. Thank you. Guests are asked not to use the fireplace for the safety of all guests. 24 hour reception with telephone, fax, e-mail and internet facilities available. Pull out sofa bed in living room. Bathrooms each have bath with shower. Maid service and linen service can be provided (extra charges would apply). Cots available on request. The apartment is on the 1st floor, access by stairs. Air conditioning in living room and main bedroom Kitchen is all electric with hob, oven, microwave and fridge. Laundry room with washing machine. Lovely villa well equipped. Clean and tidy. Would definitely stay there again. Not much around or anything in the way of entertainment without taking a taxi ride into alberfeira so would not recommend for youngsters seeking night life but for families it’s excellent. Very quiet resort. Balaia Golf Village is an exceptional resort with everything that you would need. Alan's apartment is in keeping with that. The unit is dated but very comfortable and amazing location. Alan said it would be quiet and it was, which made sleeping great, wifi worked, rain or shine, we did not care. Weather was very cool this winter in Portugal and we did have to use all heaters unfortunately, but they worked very well!! For us, it was MUCH better than -30 at home!!! Would and probably will return to Balaia again as we looked around and the resort, however older, has more space and ameneties than many newer resorts, even for non golfers. We could not use the outdoor pools because of cold weather but they were ready 2nd week of March. We gladly paid the fee for the indoor pool and were alone nearly everytime!! GREAT, relaxing holiday, easy walk to beaches, and we are over 65. Plenty of restaurants at decent prices and suipermarket Intermarché nice and easy walk of 20 minutes as well as the local market with fresh and excellent butcher and local produce. The local delicious oranges were sold everywhere and there is an orchard on the resort with fruit covered trees. The resort has great tours on offer at a discount to guests and we went to Seville. We had a rental a car for our 33 nights BUT for one or two weeks, would just do tours or stay in the area and forget about a car. We used our car on motorways to visit Tavira and Rio Formosa and the rest of the eastern Algarve. We had a blast at the Loule Festival and used toll roads when we wanted to move faster. We made Balaia home for 33 nights and with our vehicle, life was very easy and became home...we left the vehicle sitting many days. Thank you for the kind words Nicole and Nick. I am glad that you had a nice time. We look forward to having you back. Balaia golf village is in a very good location, 10 mins walk in either direction to shops, bars and restaurants. Lovley beaches are also within walking distance. As it was February when we visited we did not make use of the 6 pools on the complex and the restaurant and pool bars were closed. It will be a great place to visit in the summer. My sons played golf on the complex on 2 occasion. Although only a par 3 course it is quite challenging and very well laid out. The owner Alan has been very helpful throughout the booking process and during our stay. The staff at reception were also very friendly and helpful. Just one less than positive comment is that it took maintenance 3 days to fix the bedroom heating at a time when it was very cold. Duvets would also be a great addition for the cold nights. 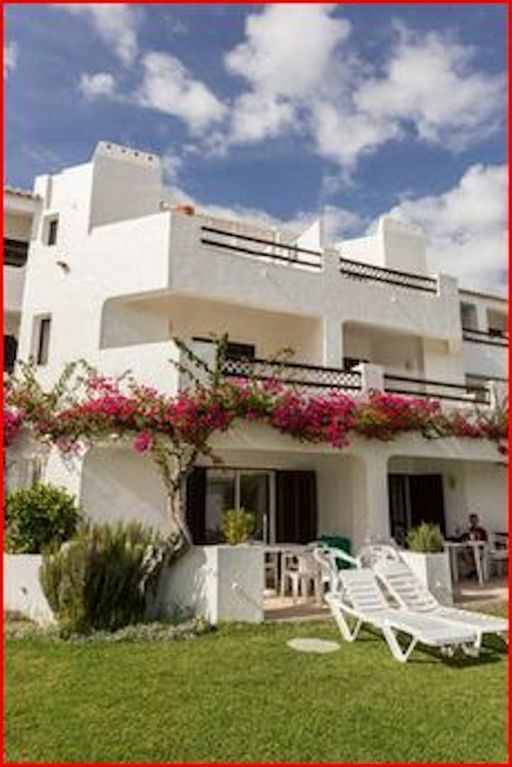 This apartment is in a quiet location on the resort and benefits from air conditioning and wifi. The kitchen has all you need for a holiday and the decor although older in style than some other apartments is well looked after and comfortable. We love this resort and I would stay in this apartment again. The property was ideal for our two children. They loved being close to the pool and having the freedom to play football and enjoy the playground near the pool. This meant that my wife and I had the opportunity to read our books, listen to music and enjoy drinks in the pool side bar. A very enjoyable relaxing and reasonable holiday. Golf: Balaia Golf Village is located in the central Algarve and as such is within easy drive of all the Golf Courses on the Algarve. For example Vilamoura is about a 15 mins drive. The Pine Cliffs golf course is only minutes away. Villa Sol, Quinta de Lago, Vale de Lobo are all within about a 30 mins. drive of Balaia. Reduced green fees can usually be arranged at the Balaia Golf Village Reception for courses on the Algarve. At Balaia Golf Village there is a 9 hole par 3 golf course (green fees 9 holes €17.50/18 holes €26.50) and driving range with, practice greens and bunkers; a basket of practice balls costs €3. The Golf Course sports a fine club house with bar and restaurant facilities.There is a resident Pro with whom golf lessons can be easily arranged together with club hire if needed. Bookings for periods other than 7 days are possible. Rentals are payable in advance. 50% deposit for bookings more than 1 month in advance. Prices are negotiable for longer bookings in the Low Season.